Wash the beets then trim off the stalks and bottom root. Leaves can be cut with stems from beet top and washed. The best way to wash greens is to just cover with water in a bowl, swirl leaves, and change the water. Repeat this process several times or until the water you drain looks clean. Using two pieces of aluminum foil wrap each beet (un-peeled) individually and place in a 400 degree oven to roast for 50-60 minutes. Remove from oven and allow to cool slightly. 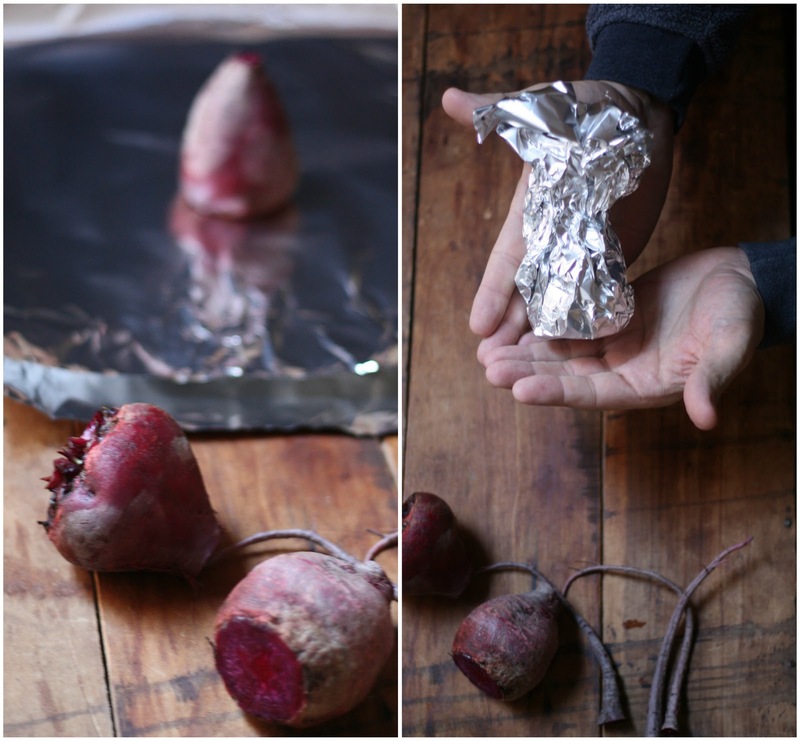 While still warm, unwrap the beets and pinch the skin — which should slide off of the beet with ease. E.A.T. tip: Latex gloves have several uses in the kitchen. 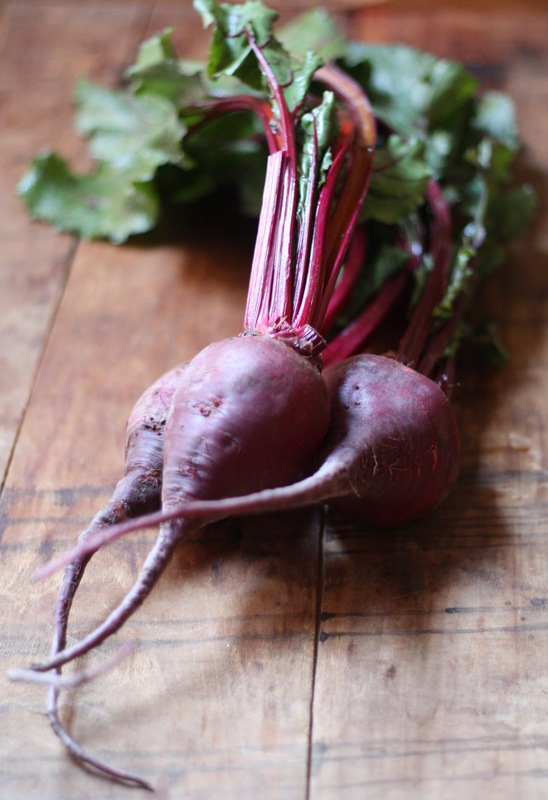 To keep the beets from staining your hands I wear latex gloves — once you are finished peeling the beets just take the gloves off and discard. I also use gloves when slicing or dicing a lot of jalapenos. Greens are sauteed in a pan with olive oil, sea salt, and fresh pepper. The greens should be heated to maintain a crunch and just before they wilt. 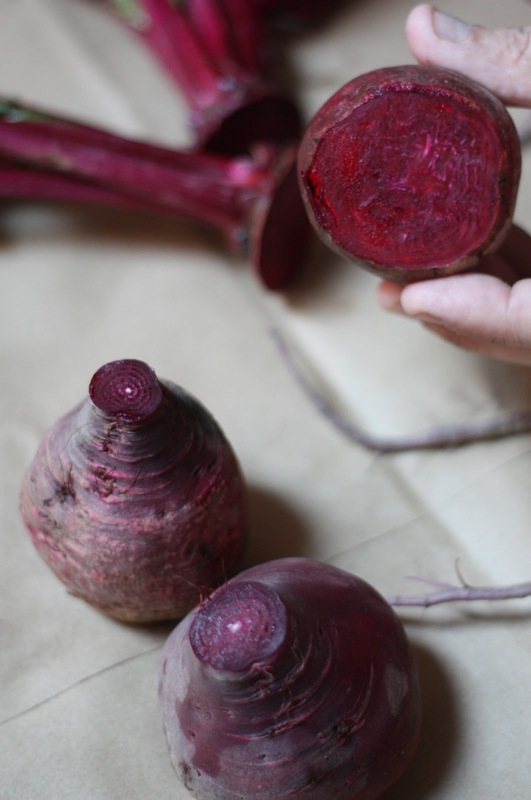 Serve the greens warm with sliced beets. I like passing a sour cream horseradish sauce around to accompany the beets and greens which is simply a mixture of sour cream with a dollop of horseradish to your preference. So my question is, Beets cold or warm? What is your favorite way to eat this nutritious root vegetable? As far as I know I have never tried a beet. It's one of those items I see all the time, but never purchase because I haven't the slightest idea what to do with them. Thanks for the tip on wearing gloves. Otherwise when I do finally prepare them, I'm sure I'd end up with crazy dyed fingers! I was lead here by pinterest (the last photo of the post has been pinned). I knew instinctively that it came from your blog. I was right! I'm ever astounded with the clarity and styling of your food photos. @ Monica get yourself some latex gloves and get at these beautiful veggies! I am sure you will not be disappointed. @ Melissa one of the nicest comments I have received. Thank you so much for the kind words! Our neighbors gave us some of their home grown beets last night and I came straight here to find your recipe. Guess I'll be trying my first beet soon! Monica, I hope you enjoy them. Let me know how things turn out!